Brush Junior Danyelle Dukes and Senior Jaylin Cody recently competed in the Regional State of Ohio Dr. Martin Luther King, Jr. Oratorical Contest on March 23rd, at Mt. Zion Baptist Church. Both students gave exceptional performances, with Dukes and Cody receiving first and second place honors respectively, in the Senior Division. As a result, Danyelle and Jaylin will travel to Columbus on April 26th, to compete in the statewide competition. 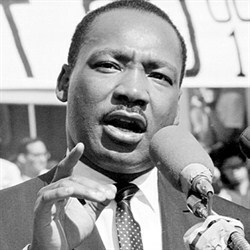 Organized by the Ohio Dr. Martin Luther King, Jr. Holiday Commission, the annual statewide contest features students in grades K-12, separated into four separate divisions by grade. This year marked the 14th anniversary of the contest, which adopted “Remaining Awake Through a Great Revolution” for its 2013 theme. Congratulations to Danyelle and Jaylin for their impressive performances, and best of luck as they prepare for the statewide competition!